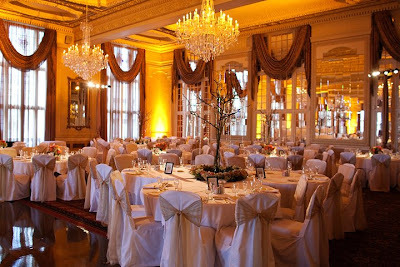 This wedding reception was a perfect seasonal party without being too over-the-top fall. Our friend, Dominie and her fiance, Brandon were married September 27th. (more personal flower and bouquet pictures to come!!) These are shots of their gorgeous reception. These 6ft. 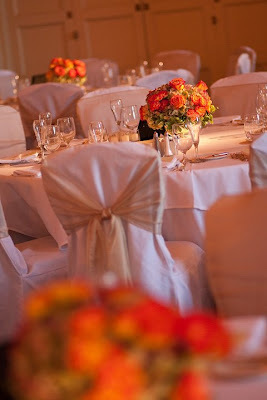 tall trees were the perfect fall touch on half of the guest tables. 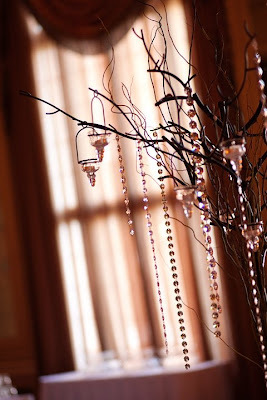 Our trees had curly willow branches up the center trunk and were draped in crystals and handing votives. The 3 sectioned wreath at the base was filled with fall hydrangea, circus roses, and variegated greenery. 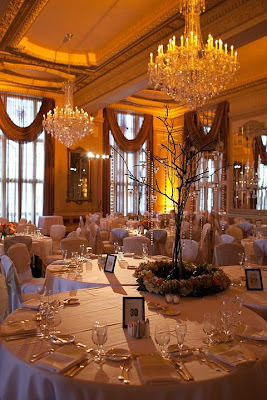 The very tall ceilings in the ballroom allowed the trees to stretch up and make a statement in the room. 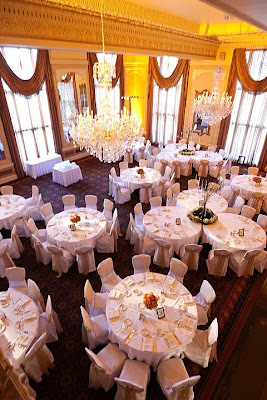 The amber washed walls (done by Exclusive Events) really warmed up the room as well, making a large space for a lot of guests seem more intimate. 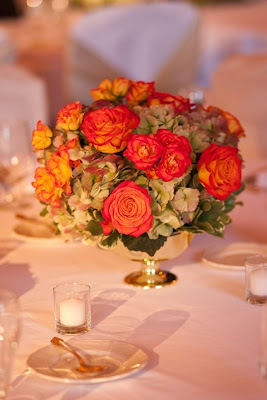 The tables opposite the trees got these full, lush, low bowls with the same circus roses and hydrangea as the wreaths. 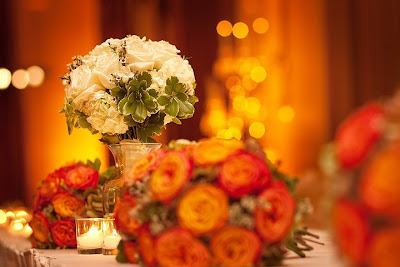 All the colors in the room really played off the personal flowers of the wedding party shown here. The bridesmaids carried the circus roses and ivory waxflower with the fall hydrangea background. The bride set herself apart by carrying a mixed, all ivory bouquet. 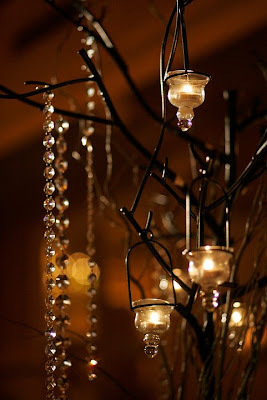 Once the hanging votives were lit and the lights were dimmed, the trees really came to life!! Another interesting use of our trees at this wedding was that there were clusters of guest tables mixed in with single tables. 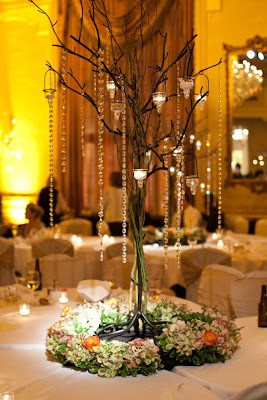 This is a new trend in a lot of wedding books and magazines and it really worked well to use our large trees at the cluster tables, and the smaller bowl arrangements at the single tables. (This is a snapshot that Emily took with her camera.) The cost of the tree rental and tree flowers was made more affordable because the tables had approximately 18 people at each cluster. More great shots of this wedding to come!! In the meantime, we wish Dominie and Brandon all the happiness that life can bring! !